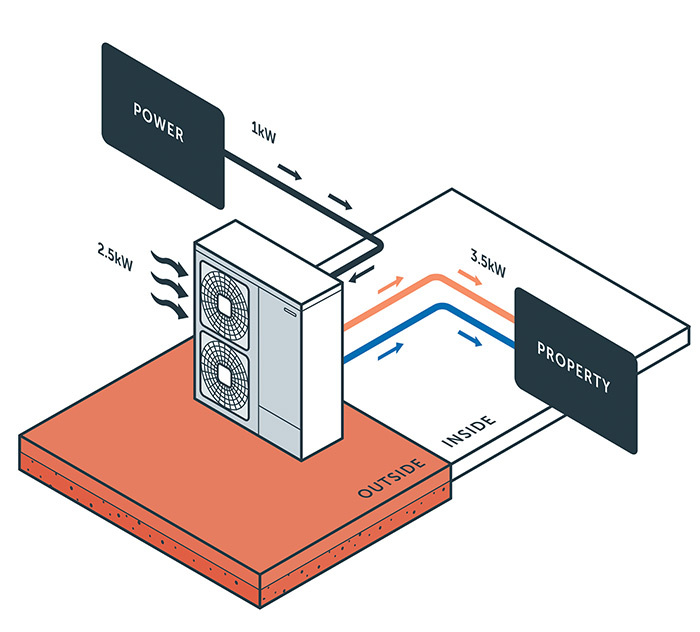 What are Air Source Heat Pumps? Air Source Heat Pumps are a renewable heating technology that can reliably supply significantly more energy than it uses, allowing a reduction in the running costs of many buildings even at temperatures as low as -20˚C. With no local CO₂ emissions, an Air Source Heat Pump can help to reduce the impact on the environment. Nialls is MCS accredited which is a mark of quality and demonstrates compliance to industry standards. It highlights to consumers that consumers that companies are able to consistently install or manufacture to the highest quality every time. Air source heating systems, sometimes known as air-to water systems, use the refrigeration process to transform low-grade energy from the air outside into high-grade energy for heating and domestic use and advanced inverter technology improves efficiency over the entire year. The continuous cycle of changing the state of the refrigerant from liquid to vapour allows the heat pump to extract the maximum energy from the air. How efficient is an Air Source Heat Pump? ASHP are becoming ever increasingly efficient with leading brands such as Hitachi Yutaki reaching 250-400% efficiency. Most heat pumps are designed to still extract heat from the air in temperatures even as low as -20. However, as temperatures drop into negative figures the heat pump will have to work harder and for longer. As a result greater electrical use will be required in colder weather. Heat pump performance is shown as a CoP or Coefficient of Performance, which takes into account a variety of factors which can affect efficiency, allowing different models to be compared. Air source heat pumps are suitable for both new-build and renovation projects where levels of insulation are in line with current Building Regulation standards. The better the insulation of the building, the less the heat pump as to work. Consequently the heat pump will reach desired temperature quicker and will not have to work as hard to maintain temperature. The ability of the heat emitter to run at low flow temperatures will significantly improve the performance of the heat pump. Therefore we recommend underfloor heating where possible. What Air Source Heat Pumps do we install? We install a range of brands but we recommend The Hitachi Yutaki Air Source Heat Pumps supplied by Nu-Heat. They are amongst the most advanced and efficient models available in the UK and in conjunction with Nu Heats customer service, technical back up and experience the end user receives the complete package with no gaps. Potential to reduce bills significantly depending on your current situation For hot water, we recommend a back up source. Potential to make money through the RHI government incentive scheme Requires electricity to operate the pump.